Marcus and Jared are two eleven-year-old friends in sixth grade. They would both like to attend spy camp but don’t have the money to attend. Jared is smart and creative; Marcus is a computer genius with the equipment to put his ideas into motion. The friends take on the task of ridding a neighborhood of an aggressive orange cat that has been terrorizing Oak Street, while at the same time getting rid of Gunner, the ne’er do well, freeloading musician boyfriend of Jared’s older sister, Ronie. A series of comical mishaps follow on both fronts. Things seem to be getting more out of hand. The adventures include lots of humor and age-appropriate scenarios for preteens and teens. Reminiscent of vintage adventures like The Hardy Boys, the characters also include strong female characters like Janet, the gossip, and Ronie, the somewhat gullible, and follow the crowd pleaser. I haven’t read the other books in the series, but if the first is any indication, I would certainly recommend the series for readers age eight and older. The characters are likable and the plot lines clever and engaging. Young adults and adults will enjoy them as well. Do you like classic fairy tales? Maybe you can’t turn down a good horror story? Not the first thing that comes to mind when you hear the name of Cinderella. 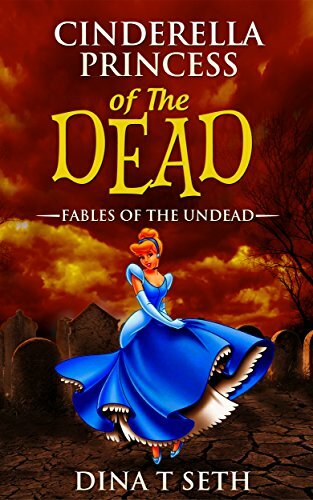 This book is a macabre twist on the fairy tale. The first scene opens with Cinderella working feverishly tending the home at the edge of the forest. Familiar characters include the wicked stepmother, two ugly stepsisters, fairy godmother and the prince. But in this version the fairy godmother is not the kind-hearted hero, the prince no heroine, and the major players become zombies who are victims of a disease that Cinderella actually initiates. Will Cinderella and the Prince live happily ever after? 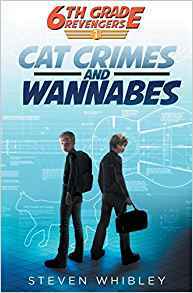 This book is cleverly written, though the amount of violence, gore and detail are too probably way too much for elementary school readers. Recommended for middle-school, young adult and adult readers who enjoy fantasy and horror stories. If you enjoyed reading this post, please subscribe by clicking on the word Follow or by hitting the RSS FEED button in the upper right-hand corner of this page. I wasn’t sure what to expect from the title of this book but was immediately drawn in by the nostalgic illustrations. 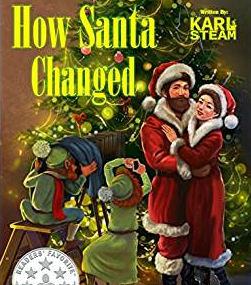 It turns out that the plot of the book revolves around the changes that took place from the time Santa was a young man to the present. In the beginning, young Santa, a magical elf, made and delivered all the toys himself with the help of one moose. As cities sprang up and the population grew, Santa could not pull his heavier sleigh with one moose. As the story continues, the reader learns how Santa came to rely on a team of reindeer, how he moved farther north, and the need to have additional helpers. Mrs. Claus even learned to bake, and Santa’s slim shape evolved to the fat, jolly character of today. Recommended for children and adults as a read aloud or holiday bedtime story. The illustrations in the book are beautifully done, even if the rhymes are sometimes a bit off. If you enjoyed reading this post, please subscribe by clicking on the word Follow or by hitting the orange RSS FEED button in the right-hand corner of this page. This book was originally copyrighted in 1942. The copyright was renewed in 1970 and reprinted by Scholastic Books in paperback format. Flip is a young, energetic, black colt with a taste of adventure. When he views the sharp horns of the cows standing beyond the fence, Flip is afraid. Flip does not understand the basis for the fear, yet it is strong. Once day he starts to back up to get away, when he finds himself colliding with his mother. She nips him and Flip runs away. Little does he realize he is rushing headlong into a herd of cows. How will they react to Flip? Are his fears unfounded? This book with black and white illustrations is soft and sweet. Dennis illustrated more than 150 children’s books. His most famous works are Anna Sewell’s Black Beauty and John Steinbeck’s The Red Pony. 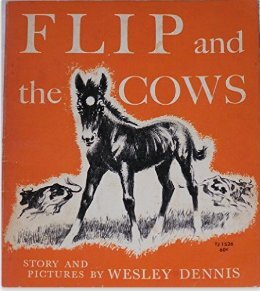 Dennis combined his artistic talents with author Marguerite Henry on fifteen children’s books featuring horses. Born in 1903, Dennis began his career as a newspaper illustrator later working as a children’s book illustrator until his death in 1966. I purchased this book for my children in the 1970’s. They spent summers in an area peppered by farms containing cows and horses so this was a favorite read. Recommended as a bedtime story vintage classic or as an easy beginning reader. Check your library. A few used copies are available on Amazon. 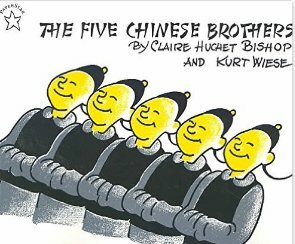 Classic tale of five brothers who looked exactly alike and how they were able to avoid a public execution and prove the innocence of one of the brothers. Although each of the brothers looked exactly alike, each one possessed a unique and special power. The first brother could swallow the sea, the second had an iron neck, the third could stretch and stretch his legs, the fourth could not be burned, and the fifth could hold his breath indefinitely. The plot involves the first brother fishing in the sea when a little boy begs to go with him. He agrees on condition that the boy promises to obey him promptly. But when the first brother swallows the sea, the little boy begins to fill his pockets with the items left behind on land. Despite his warning to the boy that he could no longer hold the sea back, the boy refused to come return and was swallowed by the sea. The brother was arrested, tried and condemned to death. He pleaded with the judge to return home to say good-bye to his mother and that is when the brothers conspire to use their talents to thwart the execution one by one. The town is amazed that the brother cannot be killed and are eventually convinced that he is innocent. This book was originally released by Coward-McCann, Inc. in 1938 and was reprinted by Scholastic Book Services beginning in 1966. 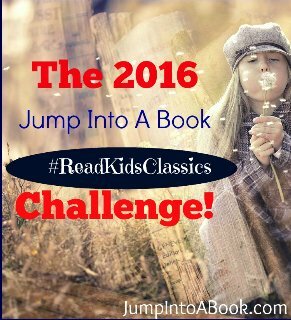 I grew up reading this humorous and clever classic and was happy to share it with my own children and students. Recommended especially for children in the five to eight age range, but it can certainly be enjoyed by any age. This book is available on amazon in multiple editions and in many formats. This classic was one of my favorite books to read to my own children or to students in my classroom at the beginning of the school year. 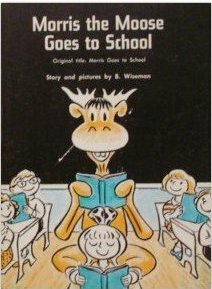 Originally published as Morris Goes to School in hardcover in 1970, Scholastic reprinted it as a paperback in 1978 under the title, Morris the Moose Goes to School. Morris never thought about attending school until he visited a candy store one day and was unable to count out his pennies to pay for the candy he wanted to buy. A kindly storekeeper brings Morris to the local school where Miss Fine, the teacher, warmly welcomes Morris. Poor Morris can’t fit into the desk and picks the wrong bathroom because he fails to understand the concept of letters. He can’t comprehend what a song is and does not have fingers to help him count to ten. Morris is unprepared; he doesn’t have lunch so he eats the grass outside on the lawn. Miss Fine is the epitome of a kind, patient teacher who never loses her patience and finds numerous concrete examples to elucidate and get her lessons across to Morris. At the end of the day, Morris learns his counting skills and is able to revisit the candy store. I love the clever way Wiseman brings the plot full circle to its logical conclusion. Children proceed step by step along the story line and learn multiple lessons along the way. Wiseman uses only three colors, brown, white and blue in each of the simple but expressive illustrations peppering each page of text. The current version is marketed as an I Can Read Step 1 book, perfect for the preschool through grade three student audience. Also a good choice for parents to include in their back to school reading list. The book is still available on Amazon in multiple formats. About the author: Bernard Wiseman wrote many books on the Morris theme. He was active from 1958 through 1995. He kept a low profile. Little biographical information is available. Amazon provides only a list of his books. One of my favorite books to be read and shared with my students and my own two children. Originally published in 1977 in Hardcover edition, today it is available on amazon in multiple formats. Miss Nelson is a sweet and pretty young teacher who has great difficulty controlling the rambunctious students in Room 207. They are rude and obnoxious, spitballs are visible on the ceiling and paper airplanes soar through the air. One day Miss Nelson fails to show up. Miss Viola Swamp dressed all in black and wearing ugly white make-up walks in as their substitute. The students soon learn, “ Be careful what you wish for.” Miss Swamp goes way beyond mean, and they could never have imagined so much classwork and homework. The children realize what a good teacher they have lost. Fear, panic and desperation flood their hearts. When it appears that Miss Nelson is not coming back, they even hire a detective to try to find her. Marshall does a fantastic job with the illustrations, which look like a combination of cartoon and watercolors. Each one portrays exactly what is unfolding in the classroom. As a teacher and mom, I certainly enjoyed the humor and reality of the situation. Targeted for ages four through eight, this book is perfect for that age group, but my second grade students chose this book as one of their favorites. The book is a fun read any time of year, but also is perfect as a back to school read. Harry Allard is the author of several hilarious books for children, including three books about Miss Nelson and four books about the Stupid family, all illustrated by James Marshall. He currently lives in Oaxaca, Mexico. 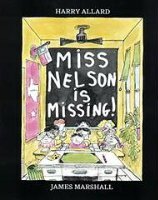 James Marshall (1942–1992) created dozens of exuberant and captivating books for children, including The Stupids, Miss Nelson Is Missing!, and the ever-popular George and Martha books. Before creating his canon of classic, hilarious children’s books, James Marshall played the viola, studied French, and received a master’s degree from Trinity College. He also doodled. It was the doodles, and the unforgettable characters that emerged from them, that led him to his life’s work as one of the finest creators of children’s books of the twentieth century. 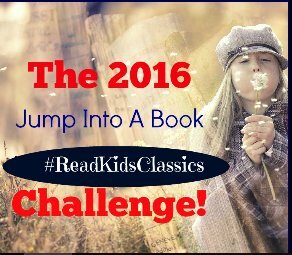 In 2007, James Marshall was posthumously awarded the Laura Ingalls Wilder medal for his lasting contribution to literature for children.